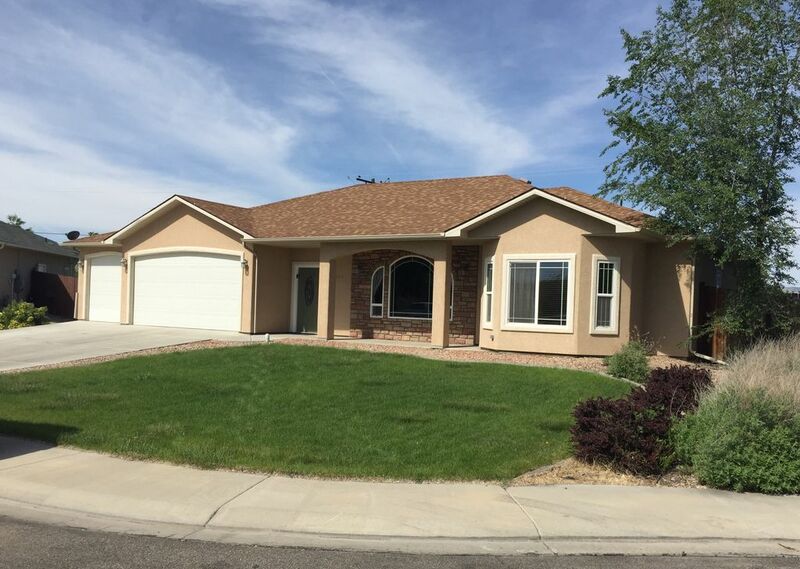 Come stay in our beautiful 3 bedroom, 2 bathroom home in scenic Grand Junction, Colorado. Our home is located in the North area in a quite neighborhood on a cul-de-sac. It is perfect for your family vacation. The house has a lovely open floor plan. The master bedroom has a King size bed, TV, it's own bathroom and an extra large closet. The 2nd and 3rd bedrooms both have a queen size bed. The large living room has plenty of space to lounge and enjoy watching netflix or cable on the smart TV. Our fully equipped kitchen has everything you need to make your meals at home. The back yard is fenced in for your little ones to run off and play. There is also a brand new modern playground in a nearby park for all of that energy! Dan and I live in Grand Junction, Colorado with our four active little boys and sweet black lab. We have been using VRBO while traveling for about 14 years now. We have had a rental listed with them since 2004. Now that we travel with our children, we appreciate even more staying in a home or condo rather than a hotel. We hope that you will enjoy the convenience of staying in a home as well. Please check out our other properties in Moab, Utah (vrbo#858611) and Copper Mountain, Colorado (vrbo#47440). This is a beautiful home in a quite neighborhood. It is a perfect home away from home! There are so many things to do in this valley! The sight seeing is spectacular. There are the Bookcliffs to the north with Mount Garfield at the far East end. To the East the Mesa, and to the south The Colorado National Monument. Take the time to drive over the Monument if you can. It's a beautiful drive that starts in Grand Junction and ends in Fruita or visa versa. There is a great visitor's center and hiking for all ages. There are many wineries to be found in the valley as well. Most of them will be over on the East side of the valley. Start in Palasade and explore to find your favorites! We are only 45 minutes from the Powderhorn Ski Area on the Mesa. The Mesa is a playground with downhill and cross country skiing, snowshoeing, and snow mobiling in the winter and plenty of hiking, camping, fishing, and mountain biking in the summer and fall. There is so much to do in this area, we couldn't possible describe it all! There is a hairdryer in the master bathroom. There is a large couch, a lazy boy recliner, and an extra large chair with an ottoman as well as a coffee table and end table. Full kitchen with all brand new appliances. Dining room table with 4 chairs. Two stools at Kitchen bar. Two TVs. One in the living room and one in the master bedroom. The TV in the living room is a smart TV. This is a single story home. We had a great time. Lots of space, large kitchen to work in. The students loved the home cooked food. Thank you!! Very clean and well taken care of home. Home is well maintained and very clean. Beds were very comfortable. We cooked several meals and the kitchen had all the necessary tools. Ran into the manager/owner when we checked in and he was extremely friendly and accommodating. Thanks! The house is nice. The air conditioner was not working the weekend we were there. It was 80 degrees in the house when we got there it got as hot as 88 in the afternoon. We messaged the home owner. Unfortunately they weren’t able to get it fixed while we were there. We went and got fans from Lowe’s as there weren’t ceiling fans in two of the bedrooms. So the stay was less than comfortable and there was no attempt by the homeowner to compensate in any way. The showers weren’t stocked with soap so bring your own. Thank you for your feedback on your experience. It is so unfortunate that the air conditioner broke on a holiday weekend. Though we were out of state, we called every repair person in the book trying to get someone out to you. Unfortunately, no one was available over Labor Day weekend. I am sorry that the house was so warm during your stay. We would like to reimburse the cost of the fans you bought as well as part of the cleaning fee. We understand that this doesn't change your experience, but we hope to convey that we try our hardest to give each renter the best stay possible. The air conditioner was replaced the day after you checked out, so this shouldn't be an issue in the future. Wonderful stay! Super nice family. Our stay at this house was fantastic! This house is at a great location. Very close to mall and Canyon Park! The grocery store is just around the block. This house has a great open floor plan. The master bedroom and bathroom were my favorite. The owners were very fast at communication! We'll definitely stay at this VRBO house again. Nice, comfortable home. Great location if you’re spending time in town. We came to Grand Junction for our daughter’s Freshman Orientation. Staying here was much better than staying in a hotel. It was close to the college, movie theater, and dining. Would definitely stay here again! Beautiful house, was perfect for the five of us. We were there for eight days. We spent our time at the ball park and it was easy access. Also easy access to I 70.